Flat and fertile, the Red River Valley in eastern North Dakota is the remnant lakebed of the ancient glacial Lake Agassiz that drained about 9,500 years ago. The Red River is one of the state’s major rivers and forms the border between North Dakota and Minnesota as it flows northward to Canada. The Missouri River is another of the state’s major rivers and the nation’s longest. The Missouri River cuts across the southwestern corner of North Dakota and enters Montana near the mouth of the Yellowstone River. Devils Lake is the state’s largest freshwater lake, and Lake Sakakawea and Lake Oahe are the nation’s third and fourth largest reservoirs. A little more than 2% of North Dakota (1,710 square miles) is covered by water. What is North Dakota’s maritime heritage? 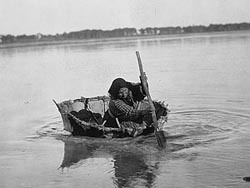 The waterways of North Dakota have been highways for trade and travel for about 11,000 years when people first moved to the region. The earliest people were nomadic hunters and gatherers while people from later time periods were semi-sedentary. Beginning about 1,000 years ago, the Mandan tribe established permanent villages and a horticultural and trading economy among the Plains Indians along the upper Missouri River and its tributaries. The trader Pierre de la Verendrye is thought to be the first Euro-American to visit the region when he traveled to Mandan villages on the upper Missouri River in 1738. Euro-American contacts increased slowly until after the region was mapped by David Thompson in the winter of 1797-1798 and the Lewis and Clark Expedition visited in the winter of 1804-1805. Early Euro-American settlements included trading posts like Pembina on the Red River, which was a key trade route for the Hudson’s Bay Company, and Fort Clark and Fort Union on the Missouri River. Later settlements included military and Indian Agency posts like Fort Abercrombie on the Red River and Fort Buford and Fort Berthold on the Missouri River. 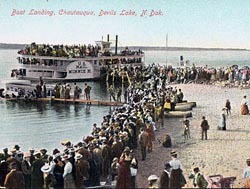 Riverboats provided the primary means of transportation on North Dakota’s rivers and lakes. The first steamboat to reach the upper Missouri River was the Yellow Stone which arrived at Fort Clark in 1832. 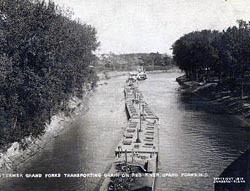 River towns like Grand Forks and Fargo on the Red River and Bismarck on the Missouri River served as ports of call and refueling stations. The Benton Packet Company, which operated steamboats on the Missouri River, was headquartered in Bismarck. The steamboat Minnie H served on Devils Lake for 25 years until 1908 when the lake level receded and settlement slackened. The Missouri River and its tributaries are shallow, full of snags and sandbars, and characterized by constantly shifting channels, making navigation difficult. Ice break-ups, boiler explosions, and fires also destroyed riverboats. Hundreds of vessels were lost on the Missouri River in the 19th and early 20th centuries. Five examples of steamboats lost near Bismarck are the Ida Stockdale sunk in 1871, the Colonel McCloud sunk in 1879, the Rose Bud sunk in 1880, the Abner O’Neal sunk in 1892, and the Expansion lost in ice in 1910. North Dakota’s artificial lakes contain the ruins of prehistoric and historic sites that became inundated when reservoirs were filled with water. Fort Berthold and at least three communities on the Fort Berthold Indian Reservation became inundated after completion of Garrison Dam. When Oahe Dam was completed, communities on the Standing Rock Indian Reservation became inundated. Remnants of these places including towns, roads, bridges, and agricultural fields are at the bottoms of Lake Sakakawea and Lake Oahe. Who takes care of North Dakota’s underwater archeological sites? The State Historical Society of North Dakota has overall responsibility for safeguarding and preserving the state’s historic and archeological sites on land and underwater. The Society accomplishes this work through its Historic Preservation Division and in cooperation with other state government departments, agencies, and political subdivisions. Among its duties, the Historic Preservation Division surveys, identifies, records, and evaluates historic properties, and nominates eligible properties to the National Register of Historic Places. The Division has identified “water navigation” as it relates to the commercial use of North Dakota’s lakes and rivers as an important theme of the state’s historic period. Historic properties falling into this theme include steamboat docks, wharfs, piers, wood yards, ferries, storage yards, freight yards, loading facilities, wrecks or wreckage, boatyards, and dry docks. The State Engineer is responsible for managing the state’s non-mineral interests in North Dakota’s sovereign lands, which includes navigable lakes, rivers, and streams. You need formal written approval from the State Historical Society and a Sovereign Lands Permit from the State Engineer to undertake activities that will disturb or destroy artifacts or any other cultural or historical resources on North Dakota’s sovereign lands. The State Historical Society issues annual permits to investigate, evaluate, or mitigate adverse effects from state or federal undertakings on cultural resources, historic buildings, structures, or objects. The State Historical Society issues one-time permits to investigate, excavate, or otherwise record cultural resources on land owned by an instrumentality of the state and to excavate cultural resources on private land. Permits are issued to qualified applicants, and applicants must deposit any archeological or historical materials found and removed from land owned by an instrumentality of the state with the State Historical Society. What laws concern underwater archeology in North Dakota? Laws about the State Historical Society and State Parks are set forth in Title 55 of the North Dakota Century Code. Chapter 55-01 covers the State Historical Society, Chapter 55-02 covers the State Historical Board Director, Chapter 55-03 is about Protection of Prehistoric Sites and Deposits, Chapter 55-08 covers the Parks and Recreation Department, and Chapter 55-10 is about Preservation of Historic Sites and Antiquities. The state’s regulations about Archaeology and Historic Preservation are in Article 40-02 of the North Dakota Administrative Code. Chapter 40-02-01 covers the State Historic Sites Registry and Chapter 40-02-02 covers Permits for Cultural Resource Investigation. Laws about State Waters are set forth in Title 61 of the North Dakota Century Code. Chapter 61-33 covers Sovereign Land Management, which includes the beds of navigable lakes and streams. Regulations about the administration and management of sovereign lands are in Chapter 89-10-01 of the North Dakota Administrative Code. Section 89-10-01-27 covers Cultural or Historical Resources.